In 2013, the Goshen Chamber of Commerce remodeled the second floor of their office building to create a co-working space for entrepreneurs. The Chamber opened the renovated space in June 2013. Response to the available space was slow (only one business applied between June – October) so the Chamber turned to Eyedart to assist in promoting the space. Eyedart negotiated with the Chamber to develop an entry-level fee targeted at home-based freelance entrepreneurs. It then reorganized the physical space, filling the otherwise standard corporate room with original art, comfortable furniture, and amenities appealing to contemporary entrepreneurs. Eyedart marketed the space through social media, public and media relations, and engaged young-professional and artist networks to identify regional prospects. Within 30 days, the Chamber successfully contracted 12 new member businesses and continues to move rapidly toward the goal of 20 renters. 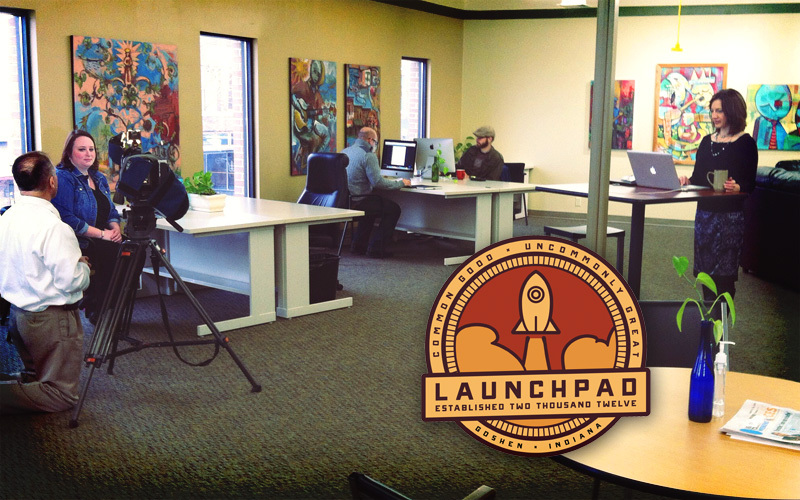 The Chamber initially envisioned being able to accommodate 20 clients in the space, and currently have about 11 different member businesses utilizing the Launchpad, with a few more applications likely on the way. We’re not at 20 clients yet, but we’re building pretty quick thanks to the help of Gina and Grace.